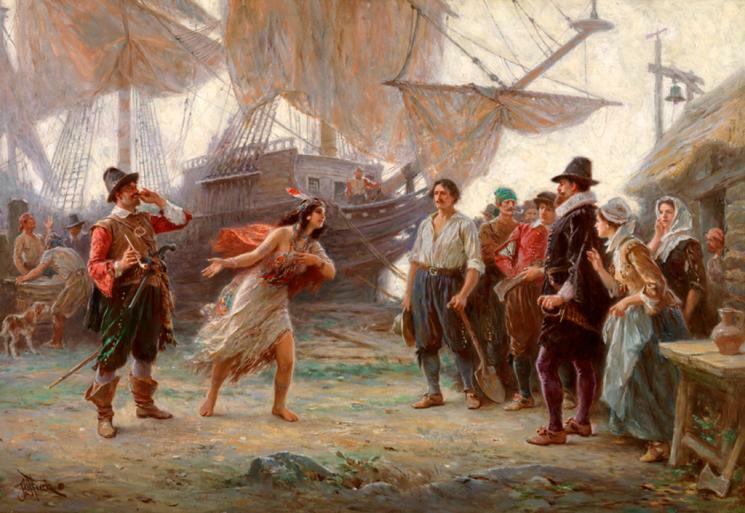 “The Abduction of Pocahontas” by Jean Leon Gerome Ferris, painted around 1910, recreates the arrival of Captain Samuel Argall (at left) at Jamestown with Pocahontas as his captive. Argall kidnapped her in 1613 “for the ransoming of so many Englishmen as were prisoners with Powhatan: as also to get ... armes and tools ... [and] some quantities of Corne, for the colonies relief.” The Europeans, who regarded Pocahontas as a princess, were surprised that her father did not redeem her, but in a matrilineal society she could not inherit her father's power and so was relatively unimportant. In this video, Caroline Legros discusses the abduction of Pocahontas. Learn about the first American poem.